It's here! To kick off our Rockin Green sponsored week on the Knickernappies Blog we're starting off with a giveaway! Giveaway runs October 11, 2010 through October 22, 2010 at 11:59pm. First entry requirement is to visit Rockin Green and leave your first comment/entry with your favorite scent and whether you'd need Soft Rock, Classic Rock or Hard Rock! Contest runs from October 11-22, 2010. Earn (1) extra entry for posting a pic of your baby in a KN diaper to our FaceBook Fan Page! 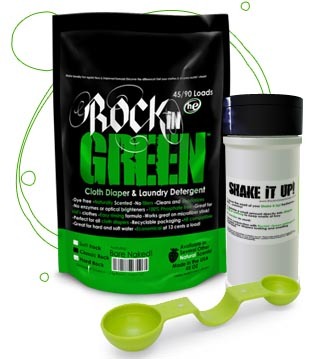 Earn (1) extra entry for becoming a FAN of Rockin Green on FaceBook! Earn (1) extra entry for becoming a FAN of Knickernappies on Facebook! Earn (3) extra entries when you Announce the Giveaway either on FaceBook or your Blog, you mays use this link http://tinyurl.com/39k6x2y. I think I need Classic Rock, and I'd love to try Lavender Mint Revival! I'm a fan of Rockin' Green on Facebook. Love the motley clean in hard rock formula! I'm a fan of RG on FB. I'm a fan of KN on FB! I would love to try the Smashing Watermelons in Classic Rock! I like Rockin' Green on Facebook! Raging against the Raspberry please in classic. Im a fan of RnG on FB. I'd like to try the Bare Naked babies scent in Hard Rock. I would love to try Lavender mint revival in classic rock! I am a fan of KN on FB. I'd love to try the new Marshmallow scent in Hard Rock. I want to try "The Green Teas" in Classic Rock formula, please! I'm a fan of Rockin' Green on Facebook! I'm a fan of Knickernappies on Facebook! I would like Classic Rock in Bare Naked Babies! For the pail freshener I would like the Rage Against the Raspberries. I am a fan of Rocken Green on Facebook! I am a fan of Knickernappies on Facebook! I follow @knickernappies on Twitter! I would like to try the Bare Naked in Hard Rock. Smashing Watermelons - Hard Rock! I'm a fan of RnG on Facebook. I'm a Knickernappies fan on Facebook. I follow Knickernappies Blog through GoogleReader. I love Bare Naked Babies in Classic Rock! I think I would need Classic Rock, and I would love to try the Smashing Watermelons. I LOVE the Green Tea's in Classic. I am a fan of Rockin Green on FB. I posted my favorite RnG scent and formula on FB! I'm an RnG fan on FB! I'm a Knickernappies fan on FB! I follow Knickernappies on Twitter! I tweeted about the RnG/Knickernappies giveaway! I follow Knickernappies Blog on Google Friends Connect! I would like to try the Classic Rock in Lavender Mint Revival. I'd want unscented in Hard Rock. I'm so excited to try the new formula! I have the Knickernappies button on my blog. My favorite would have to be the Classic Rock- 45/90 Loads in Raspberry! Makes me hungry! "like" Rockin' Green on FB as Andrea Reb! FAN of Knickernappies on Facebook as Andrea Reb! I would love to try Lavender Mint Revival in Hard Rock! I posted a picture of my daughter in her Knickernappies on your FB! I would love to try The Plain Green Tea's in Classic Rock. I'd try the unscented in Hard rock! I'd need soft rock bundle which is unscented but the shakeup I would definitely want smashing watermelons! I've been liking the hard rock and really wanna smell the smashing watermelons, ooh, or the new marshmellow, is it out yet? I'm a Rockin Green liker on FB! I'm a KN fan on FB! I follow the KN blog. I submitted my info to be a featured fluff addict! I'd choose Classic Rock in Plain Green Teas. I follow the KN blog with GFC. I follow KN on twitter. I like the Lavander Mint Revival in clasic rock. I would love some Motley Clean in Hard Rock!! Posted about the giveaway on my Facebook page! I would like the lavendaer mint revival in classic rock! I like RnG on Facebook!